say awwwww to the Orient Eggs-press… Choo Chooo… and we are on the way…. to ride with it through hail and rain. twas da Captain Pawstinks and da Howlcule Pawriot. Posted by easyweimaraner on August 2, 2018 in animals, backyard, balls, BLOGHOP, Blogville, Braque de Weimar, cats, chien, cooking, Crime, DIET, dogs, endless wisdom, pets, Travel, weather, weimaraner, weimaraners, writing and tagged Animal, backyard, Bloghop, Blogville, Braque de Weimar, Brittany, diet, Dog, dogs, Easy Rider, endless wisdom, France, pet, pets, Toy, weimaraners. Love it. Absolutely love it! You guys are such stars. Oh i say, what FUNS you fellas have!!!! HAHAHAHAHA!!!!!!!! This is your bestest paw-em yet boys. What a mystery-solving team you are. I’m not so sure I’d want a bite of your snack since we know what happens after eating that – on a train there is only one small bathroom and it might get very crowded in there! BRAVO……..the Weimbrothers are on the case! Sounds like a real bad food deal to me! Happy Friday Eve! Any fun plans for the weekend? What fun, thanks for the smiles guys! haha – thank you for the morning smiles, Phenny and Nelly☺ Love your mustache! Your French is so lovely, it made my day. 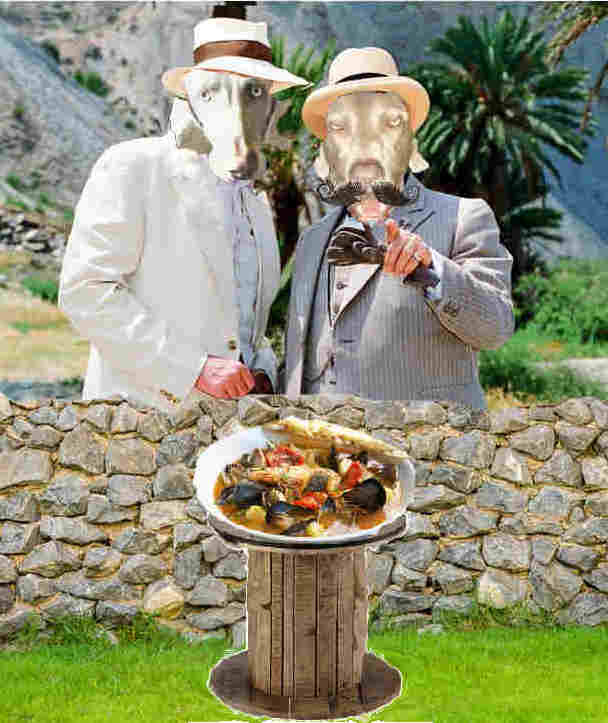 I don’t know which is funnier, the Boulabaisse ingredients or the picture of you two detectives. Good one! You must have found a rare copy of Agatha’s little known book. The Minestrone Murders. It’s valuable. We just knew that a meal with you two boys wouldn’t end well for you. That was a great poem. That is hilarious! You guys sure do look dapper for your train ride. Ut oh….we’ll pass on the Bouillabaisse if that’s okay with you. Pawsome job, guys! Guess it’s totally impawtant to read the complete menu on the Orient Eggs-Press. BOL!! What a great poem and what an ending!! Oh, boys, that was just great. 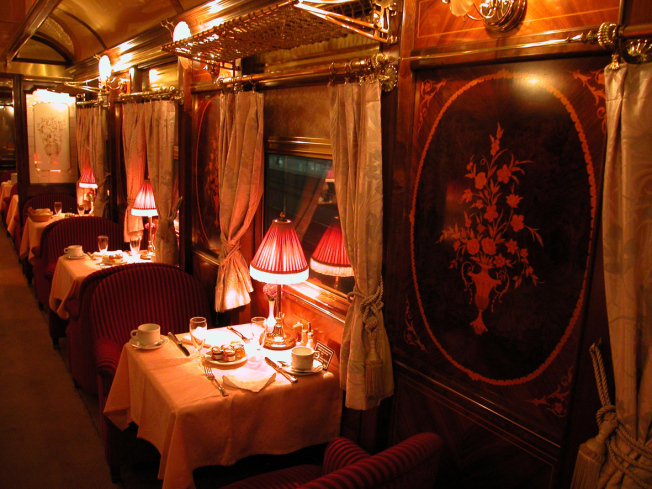 As soon as Mom saw that photo last week, she immediately thought of Mr. Poirot and that infamous Orient Express. Very well done. BOL! You boyz are just too clever! 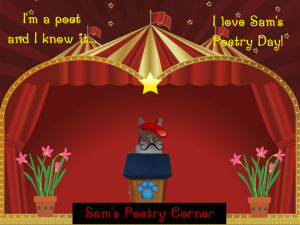 I loved the poem! OMD…you two are the finest poets in Blogville!!! Glad you two courageous boys are on the case. Keep mama away. That train is notorious for murders and you need to keep the mama safe. Uh-oh, that didn’t sound like a good ending to that story!! Phenny an Neilson that was a FURABULUSS poe-em an yur foto iss way way kewl….yur both so tallented!